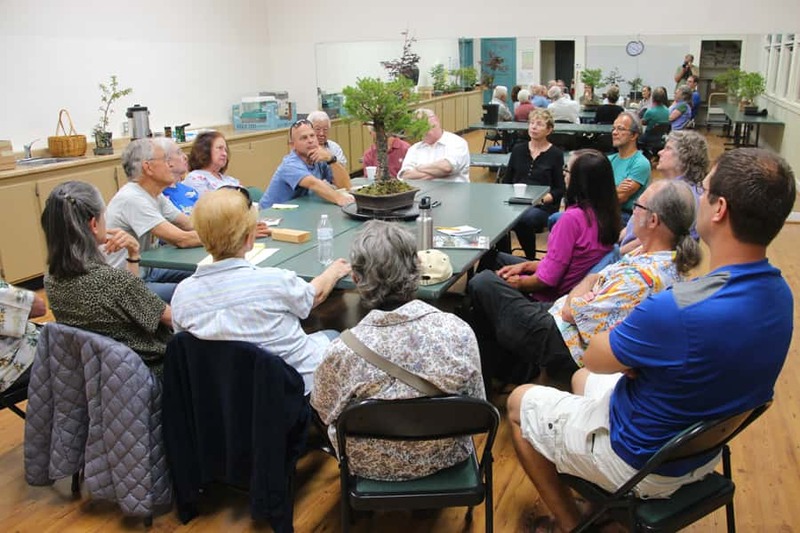 This month, we will once again have “bring your tree to work day… er, I mean, bring your tree to meeting night.” Seriously, member critique meetings are fun and offer the chance to get a group opinion of one or more of your trees. Meet and greet begins at 7:00 pm at the Goleta Valley Community Center, with the critique starting at 7:30 pm. As always, members are encouraged to take a few moments to browse through our library and check out a book or two. See you all there! Patti Post will be hosting a sale of Tom’s trees, pots and containers of soil on Saturday, March 2nd from 8 am to 5 pm. There are dozens of trees, small to large, some in pots, others in nursery containers. Pots, ranging from small to very large. Patti asks that you bring buckets or bags for soil purchases. Club Members only. Checks and cash only. President’s Message: Happy Trees Are Here Again! As I write this, lots of rain is predicted for the coming days but nevertheless I can assure you that Santa Barbara’s long, cold, dark winter is nearly over. Just kidding about the long, cold dark part, but when I took a good look at my trees this afternoon I saw that elms are fully leafed out and fresh new buds are swelling and ready to pop on many deciduous trees and even black pine buds are swelling in anticipation of a new growing season. Now, if I could only find the time to catch up on overdue transplanting. Unfortunately, we didn’t get a tree entered in the Winter Silhouettes show as we had hoped. 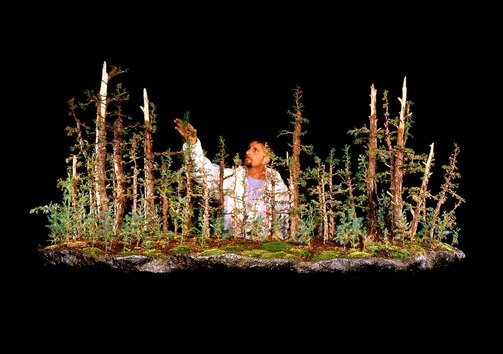 Jeff Sczechowski had volunteered to get one of Tom Post’s trees ready to show and to deliver it to Arcadia, and Ernie Witham was going to pick it up at the close of the show. The fly in the ointment was an uncooperative tree: it turned out to be a tropical tree in full leaf that just didn’t fit the theme of the show. It’s always an excellent show and maybe the club can have an entry next year if we start thinking about it with a little more lead time. Don’t forget that 2019 dues are due. You can mail them to the club PO box or pay at a meeting or workshop. We don’t want to lose anyone! Longtime Club member, Susanne Barrymore, came back for part two of her root-over-rock demo, started last January. During the first part, she attached a young maple tree to a rock using “muck” to hold the roots in place and a muslin material called “row covering”wrapped around the roots and rock to hold everything in place. When asked where she got her muck, she said: “I went to a spot where gophers had been pushing up the clay soil and mixed that soil with moss to make my muck.” Finally, a positive achievement by gophers. I’m sorry now about all the cherry bombs I’ve dropped into gopher holes on my lawn. The row covering seemed like a great idea at the time, as it was strong yet porous and would allow moisture to reach the roots. Unfortunately, the fine roots decided to escape through the material, making removing the row cloth this time quite difficult. But, with the help of several others and the patience of Job, Susanne was able to free her roots from the bonds of row cloth and reuse her gopher muck to refasten her roots to the rock and then repot her maple root-over-rock. The class — and most likely the happy gophers — cheered Susanne’s success. Cheryl Manning has been an artist since childhood and an avid gardener since her teens. She discovered Murata Bonsai Nursery in 1981 and it was love at first sight: art and gardening wrapped up in one small package. 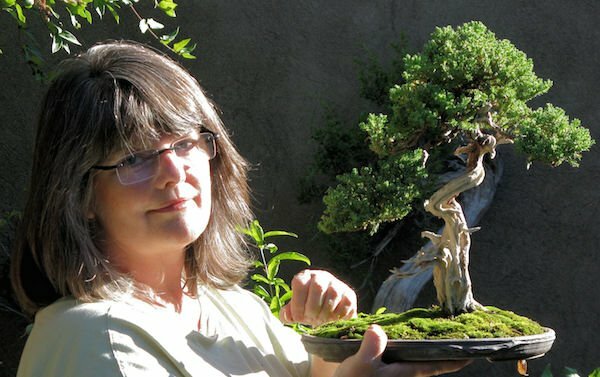 In 1985, Cheryl joined Satsuki Kai, a club of the leading bonsai masters in West Los Angeles. Because the meetings were conducted in Japanese, she understood very little, but her commitment. By 1989, Cheryl was hiking in the Tehachapi Mountains with Harry Hirao, collecting California junipers. Later, she was fortunate enough to become not only a student and close friend of John Naka, the father of American bonsai, but also an apprentice in Japan with bonsai master Yasuo Mitsuya, owner of Tokai-en in Toyohashi. 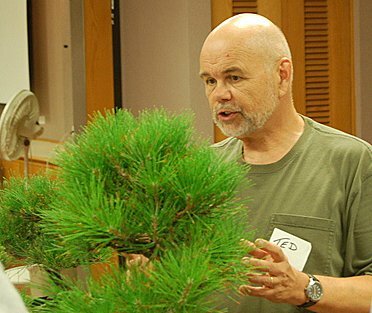 Cheryl has conducted bonsai demonstrations, workshops, and slide presentations in the United States, Canada, and Australia. 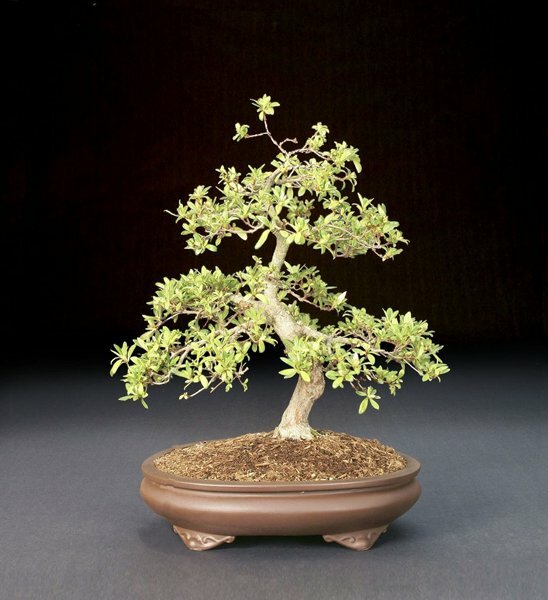 She’s written more than forty articles for many bonsai publications and currently pens a column “Trash to Treasure” for Bonsai: Journal of the American Bonsai Society. Cheryl has also edited John Naka’s Sketchbook (National Bonsai Foundation, 2005), a compilation of John’s bonsai sketches from around the world. 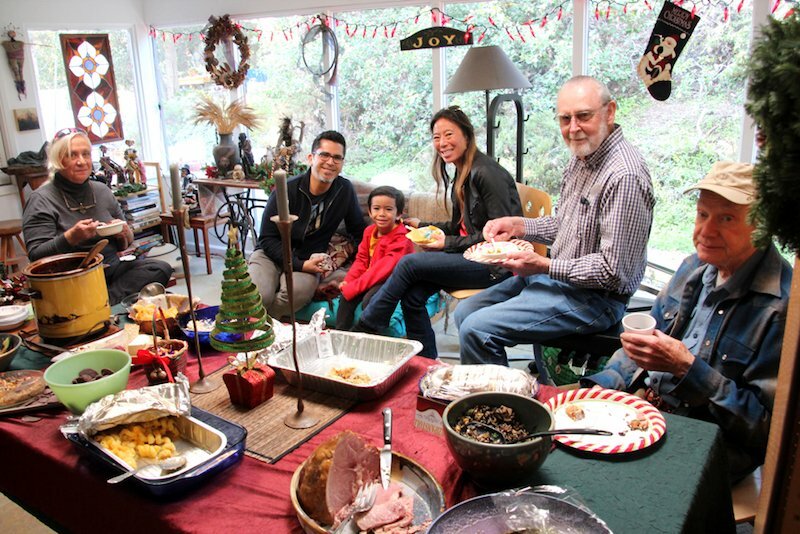 She will be helping us design and shape our trees at the Goleta Valley Community Center for two sessions: 9-12 and 1-4. Contact Steve Gibson sgibson_us@yahoo.com or Tina Hammond bhammond23@cox.net for more info. 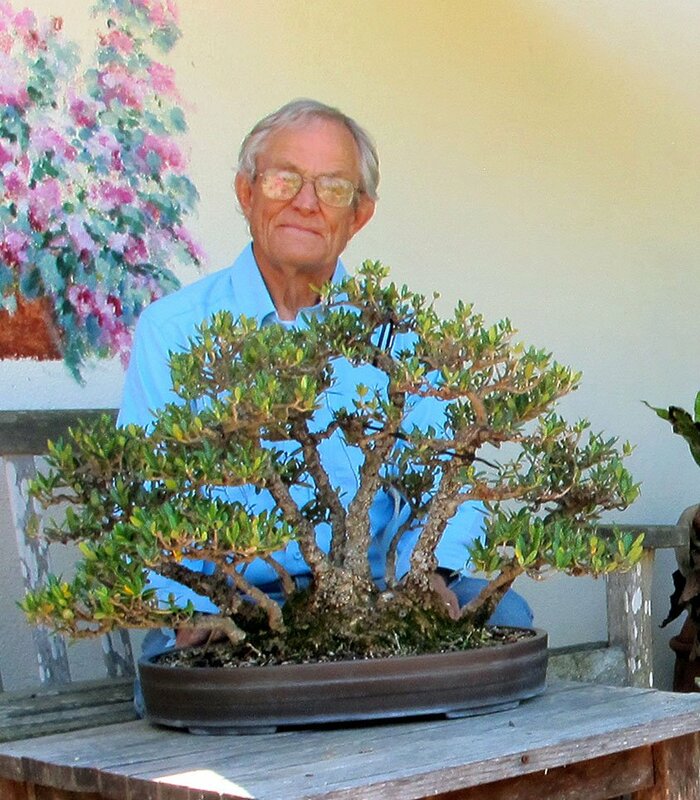 GSBF Bonsai Garden at Lake Merritt: The Annual Mammoth Auction and Sale Fundraiser will be held at the Lakeside Park Garden Center, 666 Bellevue Ave., Lake Merritt . Saturday: Auction preview at Noon with Auction starting at 1 p.m.. Sunday: Vendor Sales start at 9 a.m.; Plant Sales start at 10 a.m.; Demonstration start at 1 p.m. The Bonsai Garden at Lake Merritt will be open that weekend 10 a.m. to 3 p.m. on Saturday, and Noon to 3 p.m. on Sunday. Please find time to visit the Bonsai Garden and observe the many installments under the Garden Revitalization Opportunity (GRO) Project. For more information email bonsailakemerritt@gmail.com. I acquired this ume, Prunus mume, also called Japanese apricot or Chinese plum, from club member Rich Broder shortly after I joined the club in the late ‘70’s. Rich was one of the authors of the 1974 edition of the book “Trees of Santa Barbara”. The ume’s delicately scented flowers have bloomed profusely in the middle of every winter as long as I have owned it. Training an ume to conform to any of the usual bonsai styles is a challenge, but when it is in flower I think it is a very charming tree. preferably with you holding it or standing with it. This puts a face with the tree and also gives readers an idea how large the tree is. A before and after photo and a brief history of the tree would also be great. Send in photos and information about your tree to me at: erniesworld.humor@gmail.com. Thank you.